jsfiddle.net – what is it and why is it so useful? At work we are starting out on a web application which we will be using KnockoutJs on and jsfiddle will be invaluable, I have been watching the Pluralsight and Tekpub videos on KnockoutJs and wanted to blog about jsfiddle after watching John Papa talk about it in one of his KnockoutJS modules. Browse to jsfiddle.net and then sign up for an account, the reason you want an account is so you can save fiddles for later and come back to them in the future. For simplicity we will use the demo from the knockoutJs website which has fantastic tutorials on how to use knockout. To add this to our jsfiddle look at the left hand side looking for ‘Add Resources’ and then paste in the link to the js file and then click the plus icon. And thats it we are ready to save the fiddle and test it out. To test out our code click Run up at the top and you can use your favourite browser to check for any errors that may arise as you play around with the code. A very simple demo but you get the idea on whats possible, and if like me your trying to learn KnockoutJS its an invaluable tool. 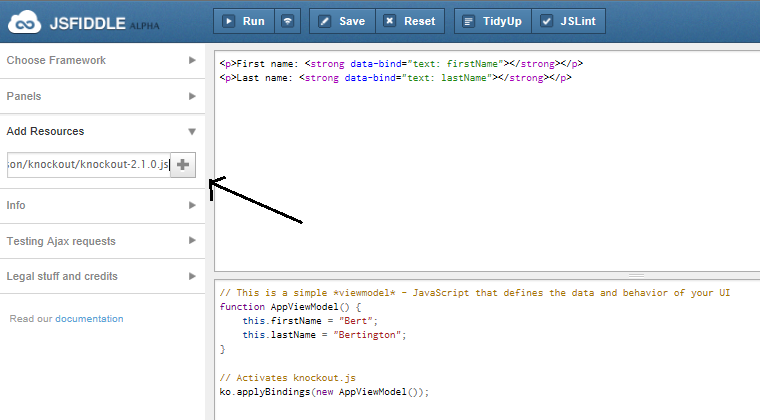 JSFiddle is a great and simple to use tool. I probably don’t use it enough due to my Visual Studio habit. Agree with you on the @john_papa tutorials – great stuff! It seems like you actually know quite a lot about this specific topic and it exhibits with this posting, called Hunter Douglas “jsfiddle. net – what is it and why is it so useful?